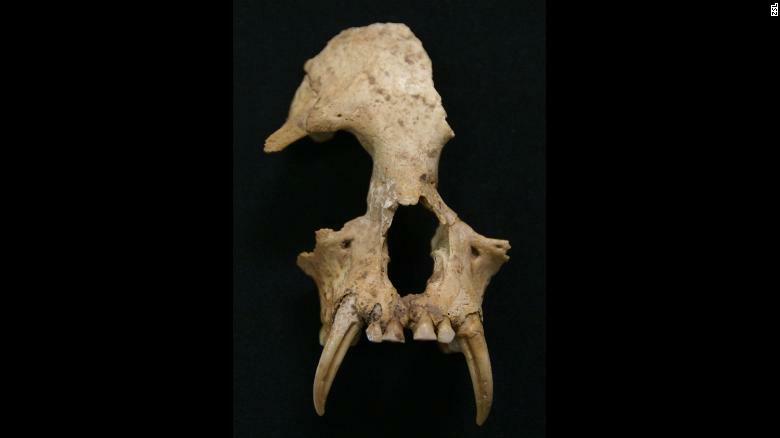 An interesting article popped up in my news feed regarding the discovery of an extinct gibbon species being discovered in a Chinese noblewoman’s tomb. (The noblewoman is thought to be the grandmother of the first emperor of China.) The gibbon, or its skeleton, was buried over 2000 years ago presumably with its owner along with a smattering of her possessions. The discovery of a new ape species is always a spectacular find, but there is an interesting twist to the story. This discovery is the first confirmed example of an ape species going extinct since the last ice age. This would likely mean that the gibbon population was directly affected by humans in some way, whether it was from habitat loss, or perhaps even from the collection of individuals for use as pets. This latter cause was common among nobles in ancient China. No matter what the cause, this discovery should highlight the precarious nature of apes’ foothold in nature. Let’s hope that sasquatches are more resilient. Scientists studying bones excavated from an ancient tomb in Shaanxi Province, central China, have discovered an entirely new but already extinct genus of gibbons. The discovery was made by scientists led by international conservation charity ZSL (Zoological Society of London), while studying the contents of a burial chamber dating from around 2,300 years ago that possibly belonged to Lady Xia – grandmother to China’s first emperor, Qin Shihuang, the leader who ordered the building of the Great Wall of China and the Terracotta Warriors. All of the world’s apes – chimpanzees, gorillas, orang-utans and gibbons – are threatened with extinction today due to human activities, but no ape species were thought to have become extinct as a result of historic hunting or habitat loss. However, the discovery of the recently extinct Junzichanges this, and highlights the vulnerability of gibbons in particular. To read the rest of this article, click this link. A male Sumatran orangutan challenges a rival by baring his teeth and shaking branches. Now recognized as a distinct species, Sumatran orangutans number around 14,000 in the wild. The below article is one of the best short articles I have read in a long time about the trials and tribulations of doing research on orangutans. While reading it, I was struck by the similarity between what orangutan researchers put up with and what bigfoot field researchers deal with, and what professionals biologists will have to deal with after species recognition. Long excursions to desolate locations, listening for howls and calls to locate the creatures, and difficulty visually observing the animals are all commonalities while doing field work on these elusive and solitary apes. I’m sure it feels like this to Cheryl Knott, but bigfoot research after the species is recognized by science will be even harder. Like orangutans, sasquatches seem to live mostly solitarly lives, or if they do travel in groups, they do so at a distance from one another. Orangutans also have large territories and wander widely, but being a terrestrial species rather than the arboreal orangutans, sasquatch range would be much larger, and they would move much faster. Keep these challenges in mind as you read the below article. Also, note the behavioral similarities between sasquatches and orangutans, such as the long calls and pushing down of trees in territorial displays. Articles like this leave me wondering about what unknown sasquatch behaviors they share with orangutans and the other apes that are waiting to be observed. Scientists are gaining vital insights into the red apes at a time when they face a precarious future. “Sometimes I feel like I’ve chosen the most difficult thing in the world to study,” Cheryl Knott tells me as we sit beneath the rain forest canopy at her orangutan research station in western Borneo. The high-pitched, dental-drill sound of cicadas fills the air, at times forcing us to pause our conversation. As we talk, Knott’s associates are at work in the surrounding forest of Indonesia’s Gunung Palung National Park with GPS units and iPads, following orangutans in their daily wanderings, recording what they’re doing, what they’re eating, and how they’re interacting with others of their species. Unlike gorillas and chimpanzees—fellow great apes that live in groups and can be followed and observed relatively easily—orangutans live mostly solitary lives. They spend nearly all their time in the treetops, they wander widely, and for the most part they inhabit rugged forest or swampy lowland that’s hard for humans to traverse. As a result, orangutans long remained among the least known of Earth’s large land animals. Only during the past 20 years or so has scientific evidence begun to outweigh speculation as a new generation of researchers has tracked the elusive apes across the islands of Borneo and Sumatra, the only places orangutans live. Click here to read the rest of this amazing article. An interesting news item caught my attention this week. Apparently, an orangutan in the Indianapolis Zoo has learned to repeat and mimic the pitch of open vowel sounds. This shows that great apes have the capacity to learn to control their muscles to deliberately alter pitch and shape of the sounds they make. This would be a necessary precursor to having language ability. It is already well established that some individual great apes can think and communicate using symbols. Koko the gorilla that uses sign language is the best known example of this. The discovery of an ape that mimics conversational tones is another interesting tidbit in our uncovering the mysteries of our greatest gift that seems to separate us from our more hirsute cousins, the use of language. There are some excellent observations of sasquatches seemingly talking to one another in what seems to be more of a language than mere animal noises. One witness from the Oregon Coast described to me what seemed to her like a language that mixed phonemes from Southeast Asia and the Native tribes of Southeastern Alaska (she had experience with both the Vietnamese language, as well as the language used by the Haida people from Prince Edward Island). Interestingly, she noted that there were clicks and pops in the vocal chattering that reminded her of the Bushman, or Khoisan, language. These sounds were articulated by two distinct voices in what seemed like a conversation. It is possible that sasquatches are just muttering to one another with no meaning behind the sounds, but I find this unlikely. The two creatures bouncing their mutterings back and forth strongly suggest some sort of conversation. It makes sense to me that since sasquatches are so human-like, they have some eerily human similarities, such as language, or at least a proto-language. The orangutan in the Indianapolis zoo is showing us, once again, the amazing abilities of great apes. They are not so different than us, and indeed show us what we once were sort of like millions of years ago. It’s akin to looking at a child and seeing us as individuals in a less-developed state. There is no lack of love or compassion in our view of children, so there should be no less in our view of apes from our species’ perspective. To understand what Rocky did, imagine if you meowed at your cat and it was able to mimic you completely. You start out in a high-pitch voice and then your cat surprises you by responding with the same high-pitch call. And then when you drop into a Barry White voice, your cat responds with its own seductively deep meow to match. Researchers at the Indianapolis Zoo observed an orangutan mimic the pitch and tone of human sounds, for the first time. The finding, which was published Wednesday, provides insight into the evolutionary origin of human speech, the team said. Rocky, an 11-year-old orangutan at the zoo, has a special ability. He can make sounds using his vocal folds, or voice box, that resemble the vowel “A,” and sound like “Ah.” The noises, or “wookies” as the researchers called them, are variations of the same vocalization. Sometimes the great ape would say high-pitched “wookies” and sometimes he would say his “Ahs” in a lower pitch. The researchers note that the sounds are specific to Rocky and ones that he used everyday. No other orangutan, captive or wild, made these noises. Rocky, who had never lived in the rain forest, apparently learned the skill during his time as an entertainment orangutan before coming to the zoo. He was at one point the most seen orangutan in movies and commercials,according to the zoo.